After we bought our 2008 Jeep Wrangler JK Rubicon, we had to decide on a supplementary braking system for the Jeep. If you don’t already know, a supplementary braking system allows a towed vehicle to use its own brakes in concert with the RV brakes. In short, when the RV brakes, the toad brakes too. In our previous toad, a Honda CRV, we used the M&G Engineering supplementary braking system, but when we looked for local M&G Engineering installers, the only one in the area had gone out of business. That’s when we decided to go with the Air Force One system which turned out to be about twice the price of the M&G system. However, we are very impressed with our Air Force One system after a month of use with our Jeep. In fact, we think that our old M&G system may never have worked. With the Air Force One system, we can actually test the system by watching the Jeep’s brake peddle depress during RV braking. Finally, though our Jeep is about 1,000 pounds heavier than our Honda CRV, we can actually feel our Jeep braking as the RV brakes. Not so with our M&G system. We opted not to use a conventional Blue Ox baseplate because it would have been located under the bumper. We do some off roading and there would have been a chance of damaging the baseplate. 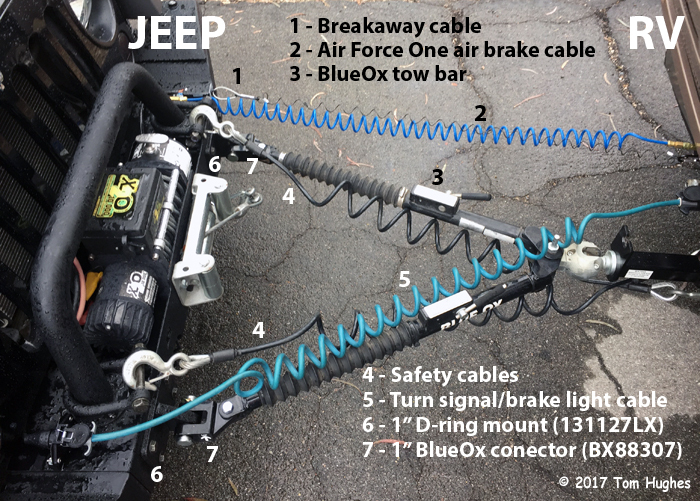 Instead we decided to connect our Blue Ox Aventa tow bar directly to our Jeep’s bumper. To do this, we had to connect the tow bar to D-rings bolted onto the Jeep’s frame. Luckily our Jeep’s non-stock bumper (Rugged Ridge XHD Modular with Storage ends) already had D-rings attached to the frame. However, they were the wrong size D rings. We needed a D-ring with a 1″ hole for the special Blue Ox tow bar end connectors, but we were able to locate a supplier for 1″ D rings.